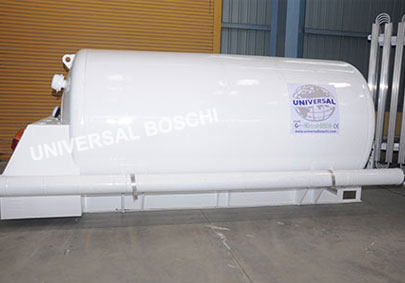 Liquid Storage Tanks- Liquid Oxygen Tank, Liquid Nitrogen Tank, Cryogenic Storage Tank, Liquid Transport Tank, Vertical Storage Tanks, Horizontal Storage Tanks, Portable Oxygen Tank, Liquid Storage & Transport Tank Price in India. 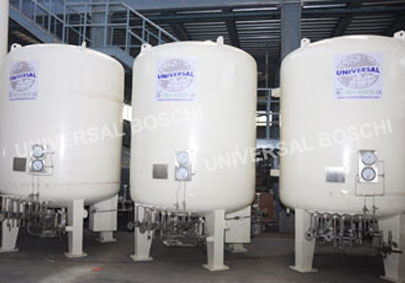 Liquid storage tank is made up of a double walled cylindrical tank. The space between inner and outer vessel consists of insulating material to safeguard it from the surrounding heat. The space is evacuated to a high vacuum in order to ensure minimum evaporation. The cold convertor used in the cryogenic storage tank is equipped with pressure building arrangement with automatic pressure build-up regulator. 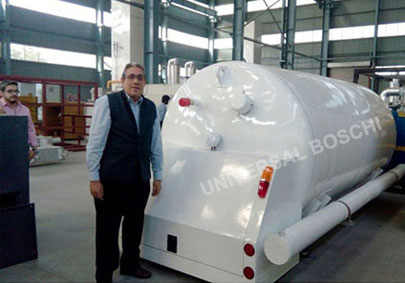 Designing of the liquid oxygen storage tank is done in way to ensure that it is sturdy, compact and easy to operate. Top end liquid filling decreases the pressure inside the tank and the bottom filling increases the pressure. The pressurizing system is used for increasing the pressure when the liquid oxygen is uploaded to tanks or gas line vaporizers. As the pressurizing system is used for regulating the opening of both top and bottom filling valve, there is almost no change of pressure during liquid delivery. It enables constant liquid supply to vaporizer. 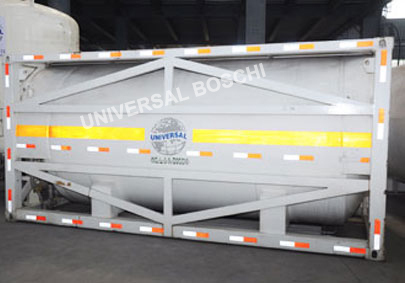 Liquid nitrogen storage tank can store liquid oxygen at temperatures up to (-196°C) with capacity ranging from 200 liters to 1, 50,000 liters with option of low and high pressure. Cold convertors are used for supplying pressure pipe line networks after gasification in atmospheric heat exchangers, storage tank networks or tanks of smaller capacity for low liquid temperature directly. Double walled – Vertical Vessel supported on Legs. High Vacuum with perlite filled in annular Space. Cryogenic valves on liquid lines extended Spindle type of Bestobell valves, U.K. / Mack Cryo/ HEROSE, Germany. 20NB/ 15NB extended spindle type. In built inside thermosyphon piping Arrangement with valves provided to make the Tank suitable for cylinder filling with negligible Losses.